Chagos, Diego Garcia, Mauritius—What has for 50 years been a secret site in the Indian Ocean—Diego Garcia, the most beautiful atoll in the world, the site of the most hideous U.S. military base—is suddenly being exposed to public scrutiny. Too many B-52’s took off from Diego Garcia to kill civilians in Iraq and Afghanistan. Too many illegally held prisoners were tortured there. Too much nuclear material is stored there, flaunting the Pelindaba Treaty for a Nuclear Arms Free Africa. In 1965, Britain stole the Chagos Archipelago, part of Mauritius, in an illegal excision in defiance of the UN Charter. It then sublet part of Chagos, Diego Garcia, to the U.S., which secretly planned to set up a military base. But Mauritian families had been living on Chagos since 1814. From 1963 onwards, they were brutally banned from returning to Chagos. Families were cruelly split asunder. People’s dogs were gassed before their very eyes. All of the people were forcibly removed from Chagos, literally starved off the outer islands, by 1973. The people of Mauritius, including Chagossians, have been struggling to put this issue on the world’s agenda for 50 years. There have been petitions, hunger strikes, candlelight vigils, forums, demonstrations by Chagossian and LALIT women, even a “peace flotilla,” bringing the issue up at conferences. Rajni Lallah leading LALIT protest march. Photo: LALIT. Now, quite suddenly, things are beginning to move. LALIT is calling for your support for reunification of the Republic of Mauritius and for the right to return. The 50-year illegal “lease” of Diego Garcia by Britain to the U.S. comes to an end in a few months. 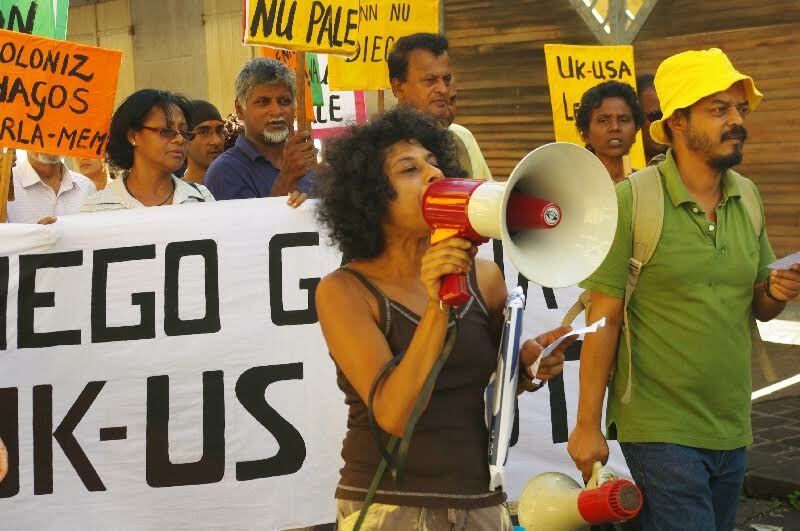 Further, the 2015 judgement of the Tribunal under the UN Convention of the Law of the Sea has stated that it is illegal for Britain to do anything with Chagos—like renewing the U.S. lease–without consulting with Mauritius. At the same time, the UK seems on the verge of granting the right to return for some Chagossians, on the condition that they accept continued colonization as subjects of the British Indian Ocean Territory—the illegal colony set up in 1965. Sir Aneerood Jugnauth, the Prime Minister elected in 2014, is finally doing what LALIT has demanded since 1985—go to the UN General Assembly for a Resolution to put a case for an Advisory Opinion before the International Court of Justice (ICJ) at The Hague. Send us a short message of support for our International Action Conference on Diego Garcia to be held Oct. 1-2, 2016. Email President Barack Obama (copy to LALIT: lalitmail@intnet.mu) calling on him to withdraw the blackmail “lasting damage” to Mauritius-U.S. relations. Include the Diego Garcia base closure in rallies and movements you’re involved in and publish this letter in your publication or website. Send us a copy or short message about any initiative you undertake, because it adds to our combined strength. This entry was posted in Articles and tagged Afghanistan, Alain Ah Vee, Barack Obama, Britain, British Indian Ocean Territory, Chagos, Chagossians, Diego Garcia, Iraq, Lalit, Law of the Sea, Mauritius, Pelindaba Treaty for a Nuclear Arms Free Africa, Rajni Lallah, U.S., UN. Bookmark the permalink.